If you have Wisconsin Dells in your plans for your next vacation, you are in for something really special. The water-park capital of the world has plenty of attractions to satisfy your appetite for adventure. So, get ready for the vacation of a lifetime. Needless to say, get your accommodation booked before anything else. Amongst the best places to stay in Wisconsin Dells for adults is the Ramada by Wyndham. How does it compare with other hotels in Wisconsin Dells? Well, you will get to enjoy all the comforts and amenities that are associated with premium hotels without spending too much. Business and leisure travelers will like what the hotel has to offer, and its proximity to some of the best attractions in the city makes it a prudent choice. All the things that you expect in your hotel room, such as TV with cable, AC, refrigerator, Wi-Fi, microwave, hairdryer, coffee maker, etc., are available at no additional cost. There are several types of rooms to choose from; you can choose a room depending on your budget and the number of people accompanying you. There is 1 king bedroom, 1 king bedroom (upgraded), 1 king bed hot tub suite, 1 king 2 double 2 bedroom beds suite, 2 queen bedrooms, 2 queen beds accessible room (for people with mobility issues), and 2 queens 1 sofa beds efficiency room. 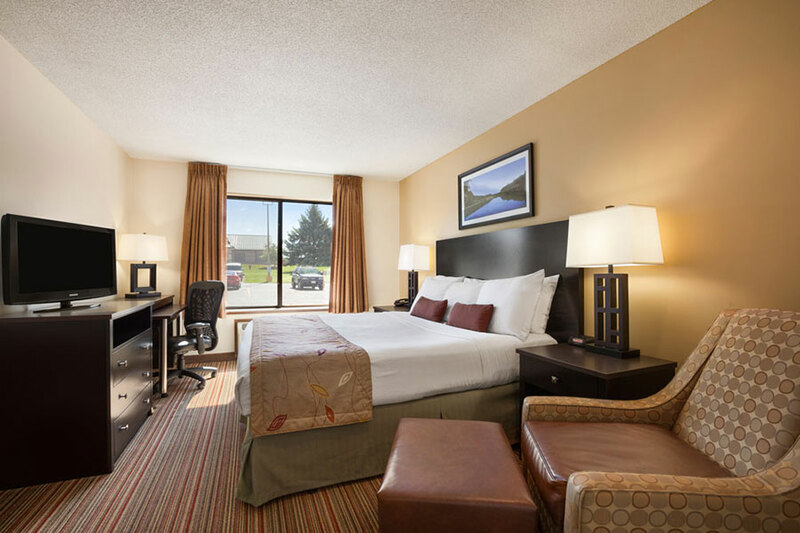 So, if you are looking for cheap Wisconsin Dells hotels with the best amenities and services, you will find the Ramada Wisconsin Dells at the top of the list.